Can these red-hot companies keep up the pace? The stock market has produced amazing results for long-term investors over the past decade, sending major market benchmarks to dramatic gains. Yet as stocks have undergone their first extensive correction in a long time to start 2018, some investors have worried that the best of times might be finished for the overall market. That only makes it more important to be selective about the stocks you choose to own. Even under more difficult market conditions, some stocks have continued to push sharply higher. 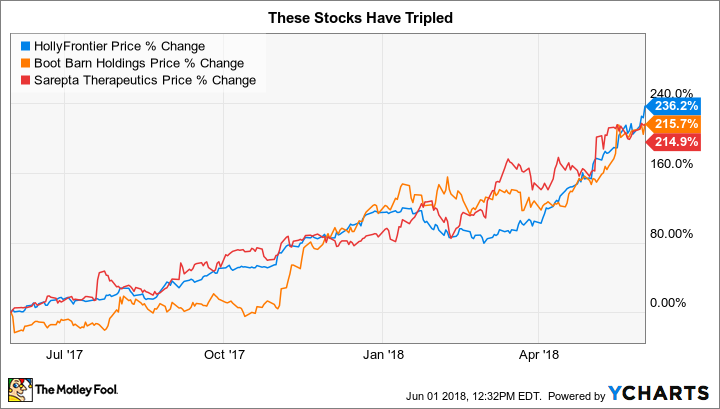 HollyFrontier (NYSE:HFC), Boot Barn Holdings (NYSE:BOOT), and Sarepta Therapeutics (NASDAQ:SRPT) have each tripled since this time last year, and bullish shareholders think that there could be further gains in store for the three companies if some key things keep going right. The energy industry has gone through tough times in recent years, but the more recent surge in oil prices has helped restore the good fortunes of many players in the sector. For refinery specialist HollyFrontier, it took a little longer to get back on an even keel, but when better times came, they came with a vengeance. The stock is up 236% over the past 12 months. Part of HollyFrontier's sluggishness in early 2017 -- even as energy was starting to bounce back -- stemmed from company-specific issues like facility outages and maintenance that held it back from taking advantage of improving conditions in the refining industry. But the company recovered quickly from that short-term setback, and now, HollyFrontier is benefiting greatly from the surge in gasoline prices toward the $3 per gallon mark and beyond. Moreover, with several peers looking at mergers and acquisitions in an effort to consolidate the industry, competitive conditions appear to be growing more favorable for HollyFrontier. By running at the highest practical utilization rates and minimizing fixed costs, HollyFrontier is setting the stage to take maximum advantage of energy's rebound. It's surprising to see a seller of work apparel and footwear with a Western theme see huge gains in the modern era, but Boot Barn Holdings has carved out a highly successful niche in the space. After having suffered with the rest of the retail industry in recent years, including a tough period at the end of 2016 into the first half of 2017, Boot Barn has produced a great recovery with a 216% advance for its shares. The answer has to do with the clientele that Boot Barn serves. The company has cited strengthening economic conditions at its store locations in areas where the oil and gas boom has created new wealth as a key element of its recent improvements. Exclusive branding and the retailer's extreme reluctance to offer promotional discounts on merchandise have both served Boot Barn well, and optimistic assessments about what's to come over the next year continue to have shareholders excited about further potential gains. Biotech up-and-comer Sarepta Therapeutics rounds out this list, having posted gains of 215% over the past year. The orphan drug specialist has taken some high-risk bets, but they've shown signs of potentially paying off. Last summer, analysts had been uncertain about the company's Exondys 51 treatment for Duchenne muscular dystrophy, with an annual price tag that's well into six figures that put the drug under fire in a debate about drug pricing practices. Yet favorable sales figures early on reassured investors, and that momentum carried throughout the rest of the year. 2018 has been even better for Sarepta. In its most recent quarter, Exondys sales nearly tripled, and the company appeared to be excited about its prospects for other pipeline treatments. However, shareholders appear to be ignoring concerns raised by a less favorable evaluation of Exondys from European regulators. Early-stage biotechs are always risky, and Sarepta's future is far from certain despite having a potential blockbuster on its hands. The important thing about these three stocks isn't that they tripled in the past year but rather whether they have the growth chops to keep their shares rising. Sarepta has considerable risk, but favorable conditions for HollyFrontier and Boot Barn offer good chances for further gains in the coming months.